Holi is the festival of colors, Holi signifies the end of winters , start of spring and start of festivals. People celebrate holi by applying colors to each others, throwing balloons and playing with pickari's having lot of fun in doing this.Here we have collected Happy Holi SMS Wishes Quotes Greetings Messages.Pick the best one and show your your heartiest feelings and blessings on the dear ones and to those who stay far off.
" मथुरा की खुशबू "
" गोकुल का हार "
" वृन्दाबन की सुगंध "
" बरसाने की फुहार "
" राधा की उम्मीद "
" कान्हा का प्यार "
" मुबारक हो आपको "
अगर लगने लगे मधुबन, समझ लेना की होली है..
जब गाये ताल पे धड़कन , समझ लेना की होली है"
आपको सपरिवार होली के त्यौहार की शुभकामनाये. To Add More And More Colors In Your Beautiful Life. Let me make your Holi more colourful with the colours of wishes of my heart..
With a wish that you attain success ,bliss and prosperity and always walk on road of Peace, Friendship and joy. May the colours of this festival fill ur life with lots of memories and moments which will cherish u forever. 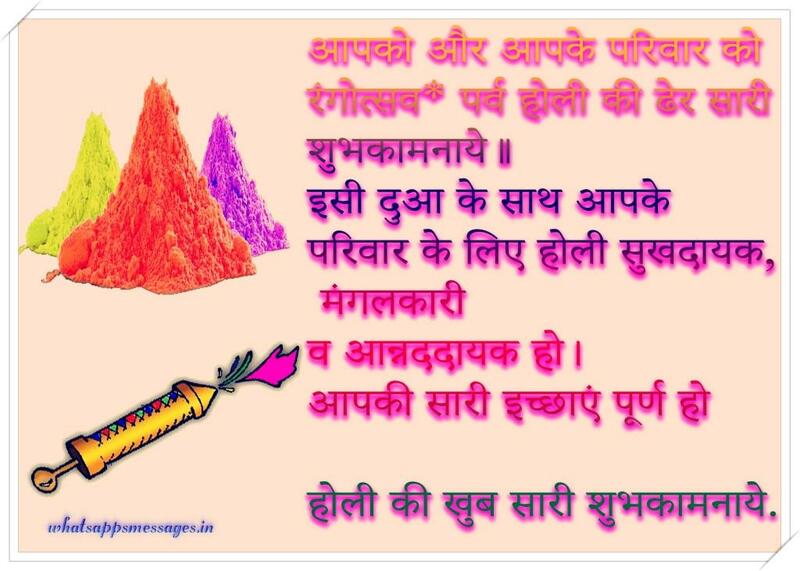 Wishing u and ur family a very “HAPPY HOLI”..
इसी आशा के साथ आपको और आप के परिवार को मेरी तरफ से बहुत सारे रंगों भरी शुभकामनाए!! !